Oh these are all great ideas Barbara. I was able to add a chair to my bedroom and what a difference it makes. I put one of those really soft furry throws on it and I use it to sit and read in peace and quiet. Works well and looks really nice too! Thanks for all these tips. Those furry throws make such a difference in a space. They add warmth and texture. Good call. And I love that look too! I used to have a chair in my bedroom and I agree it is a nice touch. Since moving, my space is smaller and limits me in decorating. You always have excellent ideas, though. Thanks Pat. Have to agree that a chair adds a lovely warm touch to a room, and like Grammie mentioned above, featuring a fur blanket takes it to another level as well. These are wonderful suggestions Barbara! I tend to decorate a room exactly as I want it and then leave it for decades. Of course, that means it ends up looking out of date to everyone else. 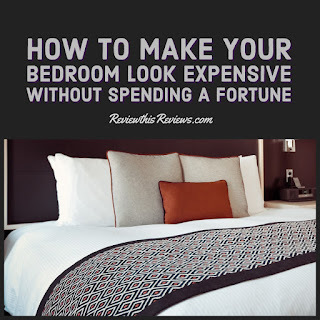 The blanket at the end of the bed or changing lamp shades would be a great way for me to update a room without having to invest in a complete overall. I also love the tip about the floor to ceiling drapes. I really need to do that in our bedroom to block the sun that peeks over the tops every morning as well as giving the bedroom a needed update. Great suggestions. I love the elegant look of floor to ceiling drapes. I am getting ready to add a comfortable chair to my master bedroom.